The holiday season is a festive time of year filled with valuable family time and an endless supply of unforgettable memories. For many, these feelings of seasonal happiness may have caused you to lose control of your holiday spending. There is nothing to be embarrassed about; you’re not the only one. Many Americans struggle with this newly acquired debt every year. Unfortunately, this creates a shaky foundation for a more stable financial future for the upcoming year. There are a few things you can do to combat your new holiday debt. Around the holiday season, many companies have special offers to entice consumers to purchase their products. These offers often come in the form of store or brand specific credit cards. Many offer low to zero interest for a limited time. CreditGUARD doesn’t recommend opening these types of credit accounts, especially if you’re struggling with debt. However, if you purchased gifts through one of these credit cards, allocate a large portion of your debt reduction budget to lower these balances quickly. These cards are fantastic deals in the beginnings but can come with high-interest rates farther down the road. Quickly eliminating high-interest credit cards will help you from accumulating more debt over time. Every year friends and family try to purchase you the perfect gift. Even with their best efforts, they can miss the mark. It’s normal to go to a store and exchange these gifts for another item you rather have. 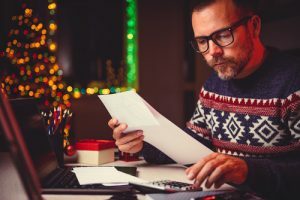 This option is an excellent solution for the short term, but it doesn’t help you eliminate holiday debt. Instead of exchanging it, try turning your unwanted gifts into money. Online marketplaces like Facebook and eBay are great locations to sell items (especially if still in the original packaging). If the gift giver gave you a gift receipt, you could simply return the item. You may feel guilty using these presents to fund your debt payments but don’t. A bright financial future is more valuable than a new sweater or expensive gadget. If falling into the cycle of accumulating massive holiday debt and struggling to pay it off is a regular occurrence for you, taking time to strategize your gift purchases can help break the habit. The first step is to get an early jump on your holiday buying. One or two items every month can help you avoid relying on credit cards for multiple purchases at one time. If planning your holiday shopping seven to eight months out feels too daunting, try to create a savings account specifically for this time of year. Putting aside a small amount from each paycheck starting in January will prove fruitful come December. Just make sure not to spend it early!Holiday debt is only a small part of the growing debt for many Americans. As missed payments continue and harassing credit collectors call, it’s easy to feel lost in your financial situation. Use the new year as a starting point to turn your financial life around with CreditGUARD. Our team of certified credit counselors is ready to assist you with financial education and debt management programs needed for a brighter future. Call us today at 1-800-500-6489 to learn more about our credit counseling and debt management programs.